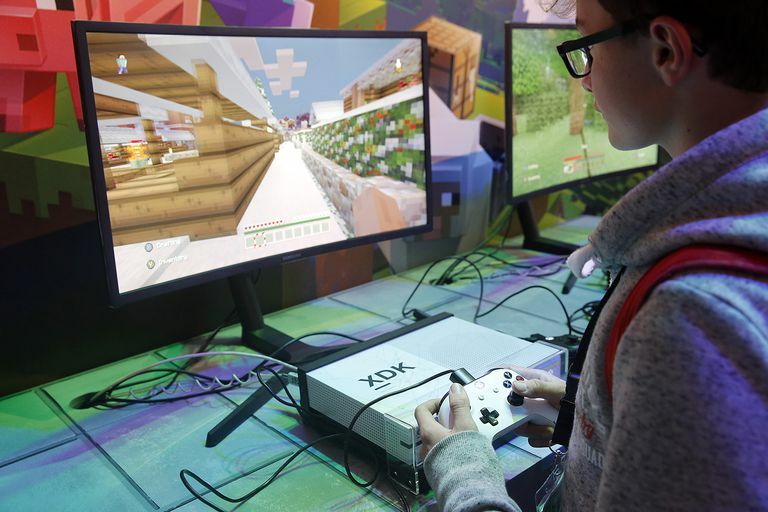 A gamer plays the video game 'Minecraft' on a Microsoft Xbox One X console during the 'Paris Games Week' on October 31, 2017 in Paris, France. For millions of people around the world, finding ways to lose and relieve stress can be a significant factor in stressing them out as a whole. While reading, exercising or focusing on a favorite hobby is a stress reliever for some, video games are a method for others. At times, video games allow people to relax and ignore their outside causes of stress. Playing these games allow many to feel better for the time that they are partaking in their hobby. In this article, we will be discussing why the video game Minecraft in specific has such a tremendous potential for being a reliever of stress. Let’s get started. Escaping stress in your everyday life gives a person the ability to take a breather from what is bothering them. It can be an intense day when everything that you do to attempt to calm yourself down doesn’t work in the slightest. One of the major positives of playing Minecraft to relieve your stress is the lack of a goal to achieve. While many players create goals for themselves, there is no specific set challenge for a player to accomplish within the game. The lack of a goal being given directly to a player gives the person playing the opportunity to create their desires and achievements. While some players may feel accomplished creating a castle in Survival, another may feel accomplished building the same castle in Creative mode. The ability to pick and choose what you feel like doing gives a new and somewhat unfamiliar feeling in gaming. Most worlds in video games seem to have a barrier, a place where a player is not meant to pass, showing a forbidden place in which players may not interact with. Minecraft takes the word ‘endless’ to a brand new level, with worlds spanning millions and millions of blocks wide, seemingly impossible to see absolutely every creation in a world. This endless world helps players understand that they have not experienced the unknown, giving players the chance to travel to unknown lands or letting them stick to what they know and stay in a precise radius set by their comfort of leaving. Whether a player wants to stay in a small location, or whether a player wants to explore as far as they possibly can, Minecraft’s nearly infinite span of blocks lets a player dictate what is right or what is wrong in their world. The reassurance that you are the manipulator of your world, and may dictate what does or does not happen, can give players the satisfaction of understanding that the world in which they inhabit is theirs to alter at their wishes. One of Minecraft’s most significant selling points is the ability to create whatever you feel like. In a video game where you’re given hundreds of blocks to choose from, Minecraft allows players to get incredibly creative. If you’d like to build a house, a flat 8-bit character, your very own Redstone invention, or whatever you think up, Minecraft will let you do it. Many have succeeded in finding Minecraft as a very expressive creative outlet. Having an outlet to utilize and to put all of your efforts into is very important in life. Whether your outlet is writing music, playing a sport, making art or anything else, it’s always beneficial to have. Minecraft gives the player the ability to imagine new concepts and create them in an easily accessible medium. One of the significant problems facing creators is not having the proper tools to fuel your creativity. With Minecraft, all a person needs to start to create is to have the video game and to have an imagination powerful enough to portray what they’re thinking directly into the game. Many players have gone as far as creating cities, adventure maps, and even a ​real-life Christmas tree being controlled in the game itself. With Minecraft, limitations hardly exist. If an idea comes to a player’s mind, there is more than likely a way to create it. While it may be tough to bring what you imagine into a virtual representation, as long as you try your hardest and are willing to finish the project, you will more than likely have a great creation. Minecraft’s music is a very memorable aspect of the video game itself. Adding a very ambient soundtrack to an already beautiful game brings Minecraft’s ability to pull you in and lose yourself in the game to a new level. Instead of adding extremely energetic music to the video game, C418 supplied Mojang with a very calming genre of music. C418’s songs will kick in at the greatest of times, allowing for an incredible amount of immersion. The music alone is enough to relieve stress for many players. When the music begins playing, you may find yourself losing track of time that has elapsed since it began. Most music in video games can become very annoying, continually looping from the beginning of a level until you get yourself to the next part. As Minecraft is a nonlinear video game, having no end goal, the music of the endless looping variety is entirely unnecessary. When playing, you will quickly find that Minecraft’s music will begin playing at completely random intervals. As Minecraft’s music is on no directly planned or dictated schedule, players are generally more accepting of the music playing. At times, players may not even notice the music coming in or going out as the subtlety of the music isn’t generally enough to annoy. While there are some that dislike the music, many players find it to be relaxing. Finding a way to relieve stress is all about finding your comfort zone. To find your comfort zone, you may need to switch some things up and cater to your needs. Minecraft’s insane amount of customizability may help you out in relieving your stress. If Minecraft’s default textures and sounds aren’t satisfying your needs, you can easily replace them. Mojang has taken it amongst themselves to add an option to give players the ability to change and alter their Resource Packs. Resource Packs can change the look, sound, models, fonts, and much more of your Minecraft experience. While some Resource Packs can either be too busy or too simple, there are many options available that will bring Minecraft closer to what you’d like to experience. Another texture that may be changed and customized is the skin of your Minecraft character. While on the subject of experiencing Minecraft the way you would like to, modifications to the game can allow for great experiences. Minecraft has an extensive range of mods. These modifications to the game can be straightforward (such as the TooManyItems mod) or very complex (like the Aether II mod). These modifications can be extremely game changing and can add for great playability. Playing Minecraft with friends can inspire new adventures and can aid in relieving stress. While playing Minecraft in multiplayer, players can enjoy seeing their friends in their blocky form. With friends on a server and with many new things to do, players can ignore their causes of stress while playing. Your group of comrades may want to dig deep into the aspect of Survival mode and work together, creating an impenetrable fortress. If you’re feeling bored with Survival mode, you and a friend can hop on another server and play some mini-games. There are various types of mini-games, spanning from parkour, to spleef, to Survival, to strategy. These games can be great for creating a stronger bond for the players involved in terms of teamwork or can create a competition between the two. In the end, the mini-games are all about fun. Minecraft’s repetition is a significant factor in why it’s so loveable. When a player gets into his or her groove while playing, you’ll notice they’ll more than likely be doing a lot of what they’ve been doing the entire time. After a while of playing, you’ll find that it’s effortless to remember how to do the various tasks that were once extremely hard to remember. Crafting and creating Potions becomes extremely memorable and is easily replicated, knowing how to locate Diamonds becomes second nature, fending off against enemies becomes muscle memory and much more. With every new update, however, Mojang will always throw us a curveball and will give us a new feature to get familiar with. Minecraft has fueled players in ways that have been considered unimaginable until the creation of the video game in 2011. For many, this video game has been an escape, an entrance to a new community to be apart of, an outlet for art, and much more. The reason for Minecraft’s success has been defined by the support that players have given the video game over the years. Being re-released on various platforms, gaining the addition of Minecraft: Story Mode and Minecraft: Education Edition, a movie that is currently being produced (and much more), Minecraft is only getting started in being an inspiring and wonderful way to relieve stress.